Preferred IUPAC Name: Potassium Permanganate Infection: Treatment fungal infections of the hands and feet. Payment We accept the following forms of payment: PayPal (The Preferred Method) Bank Transfer Cheques (subject to clearance) Dispatch Postage Delivery And Weight Restrictions The items will be dispatched on the day of purchase were possible. Depending on the item/product (hazardous non hazardous) will dictate the shipping methods used: which include, UPS, UK Mail, DHL other couriers, Royal Mail 24 (with Proof of Post) RoyalMail24 Recorded Delivery Overnight Courier Royal Mail Small Packages (with Proof of Post) International Signed For Overseas Couriers Items dispatched by courier which include items over 2kg and up to 30kgs can be shipped to UK mainland Islands and Highlands, all EU countries and mainland North America (except some remote areas) and most of the rest of the world (see below for exemptions and additional costs) Unfortunately items over 2Kgs cannot be shipped to Russia. Items will be dispatch within one working day (Mon – Fri) of your purchase, Saturday deliveries are classed as special delivery ( courier only). Goods delivered by courier will require a signature. Items dispatched by Track and Signed posted from UK abroad (including the EU) will require the buyer to provide a contact phone number, which may be used by the courier service, if the item cannot be delivered. Please ensure there is a contact number in your address details’. Please note that if you choose a non – tracked postal service we cannot provide any transit details other than the confirmation that your item has been dispatched. Some parts of the UK including parts of Scotland (Highlands and Islands) & Northern Ireland attract additional tariff or maybe shipped economy class. The isle of Man, Channel Islands, and Isle of Silly also attract additional postal tariffs. Please note that parts of Europe and the rest of the world also attract additional tariffs (remote locations and Islands) Feedback We (as all other businesses and individual sellers) on the eBay site depend upon customer satisfaction in the form of feedback. Therefore we make every effort to describe the item in as much detail as possible, we dispatch the items (if received early enough)on the day of purchase.We would ask that once you have received your item and you are completely satisfied with the product our sales, service and communications, we would ask that you leave 5 star positive feedback.I am sole seller and like most people selling on eBay I do strive to provide the items for sale at a price that is both realist and fair and I really do appreciate your feedback. Your legal rights: When you purchase of goods from Labtech_6 , you have the normal rights of a consumer who purchases goods from a high street store. Your statutory rights apply to online shopping. General MSDS (Material Safety Data Sheets) are available upon request. Please ensure you are fully conversant with the product before use.. All of our products have a clear and appropriate label indicating the contents and dangers associated with the product. If unsure - Please ask a question through the eBay messaging system Returns policy: You have a right of refund if you no longer want or require the item up to 30 days after delivery. Please note that due to ever increasing price of postage, please note that, should you simply not want or require the item, we will expect you to pay both cost of sending the item and the return cost. In addition to your normal consumer rights, we also allow you to return the faulty goods up to 30 days after the delivery date. After 30 days, we do not accept returns unless the goods would reasonably be expected to last longer (please note that the majority of goods sold by Labtech_6 are new items unless otherwise specified . We will offer a replacement part/item if we have one in stock. We would ask that you return the item in its original packaging, where possible both to protect the item and for the re-use of the packaging. Please note, should you not have the original packaging it will not affect your return, but should the item be damaged upon return due to poor packaging we will not issue you a refund. Modification of Items: Please note parts dispatched will be checked for functionality before dispatch. Most items will not require modification for the primary purpose they are designed for. Please note that if you modify any part supplied by Labteck_6, will not refund or replace the item. Item Condition: Except for new items, all items will be pre-used items and may show signs of age and usage. Where an item has a specific cosmetic defect (large dents, large scratch) or missing any non-functioning parts, will be described in the text of the advert and under condition. Security Markings: Apart from our consumable items, all out items carry unique UV and or visible markings for both security and to validate all returned items. Should it not be practicable to use UV we will add s unique marking to identify all returns. Contacting us: Should you not be completely satisfied with the item you purchase or have any questions/queries, we can be contacted through the usual means. We would ask that if you contacted our sales team via messenger in the first instance. 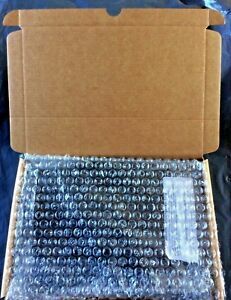 You can always open a case with eBay if you are not satisfied with our response. Please contact our team using the eBay messaging system. When using the eBay “Contact Seller” through the messaging service please choose “I have a question about using my item or I want to send the seller a message. We pride ourselves on resolving issues swiftly and to the total satisfaction to the customer. Opening a case just slows the resolution process down. You always have the option (at anytime) to open a case if you are not completely satisfied. For further information please use the messaged the seller at the bottom of the advert Technical Support Should you have a query about an items specification or other technical questions please contact us before purchase rather than taking a chance that the item is the right specification and then returning the item because it is the wrong specification.